My love for circus began one summer in the Pocono Mountains, Pennsylvania. I set out to be a dance instructor at children’s summer camp, Camp Westmont and left as a flying trapeze instructor. For me, there is no greater feeling than flying through the air. Those moments of complete weightlessness are unparalleled and make me feel alive. After running away with the circus for five consecutive summers at what became my home away from home, I've collected various circus skills, but completely fell for aerial silks. I began teaching aerial silks classes in Northern Ireland with a great friend and fellow aerialist and together we were Aerial Revolution. We wanted to make circus accessible to everyone in our community and get people involved in what they had likely seen in Cirque du Soleil. 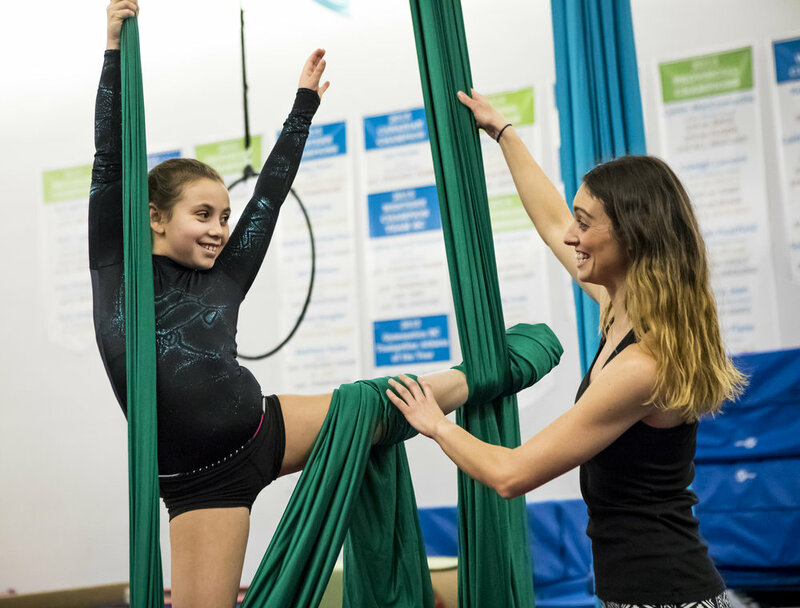 We didn't want to be an exclusive circus school, but rather a safe space where anyone from any background, fitness level, age, gender or ability could come and share our love for circus. As partners, Jill and I learned a lot along the way together as Aerial Revolution, but parted ways as she pursued Australia and I set off for the Mountains. For the first 9 months of my life in Whistler, my aerial silks lay neatly folded under my bed. I was in the most amazing place with beautiful surroundings at my disposal and still something was missing. I grew restless of not being able to do something I was so passionate about and finally the opportunity arose to teach silks at Whistler Gymnastics. Starting with one adult class in 2015, Treeline is now a full-time operation offering kids, teens, adult beginner and intermediate classes throughout the Sea to Sky Corridor. I couldn’t be more delighted to share my love for aerial silks with people from all walks of life in the Sea to Sky Corridor. The ability to live the mountain life by day and run away with the circus by night is the best of both worlds. Welcome to Treeline Aerial – See you in the skies.